From whale bone fossils to hoodoos, we explore the interesting geology of the Waitaki in the South Island. Whale Fossil Site in the Waitaki district. After a morning of catching up on emails, we set off to explore a little of the expansive Waitaki region of the South Island. We set out from Oamaru where we are currently based and headed south for a few km's before heading inland. The Waitaki district is a mosaic of rolling farmland and countryside, rare lava formations, and ancient marine fossils. The climate is predominantly mild and dry. We took in some of the Vanished World Trail - a self guided trail where visitors can drive from place to place to check out the various geological formations, and extinct volcanoes which reveal the ancient history of North Otago. Our first stop is at the Anatini Whale Fossil Site situated near the town of Ngapara. Here you find bone fossils from an ancient baleen whale. The whale is preserved in a rock called the Otekaiki Limestone which dates back some 24-26 million years ago. The surrounding farmland is also dotted with various limestone arches and formations. 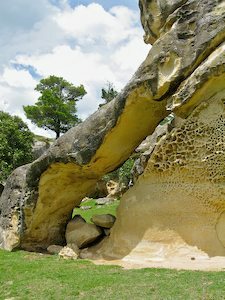 Our next hidden gem is the Elephant Rocks, geological formations created from the Otekaiki Limestone, sandy sediment which hardened to limestone and which has been uplifted in the last few million years. The formations are formed by being weathered by wind and rain. After a brief stop in the town of Duntroon to check out the Vanished World Trail Interpretive Centre we set off to the Takiroa Maori Rock Art Site. This is a wall of drawings which date back hundreds of years, although some drawings have been removed and placed into various museums around New Zealand. We then took a short drive along the Hakataramea River Valley towards the pass, passing by paddocks of sheep and spring lambs and cattle, before heading back to Oamaru and dinner.